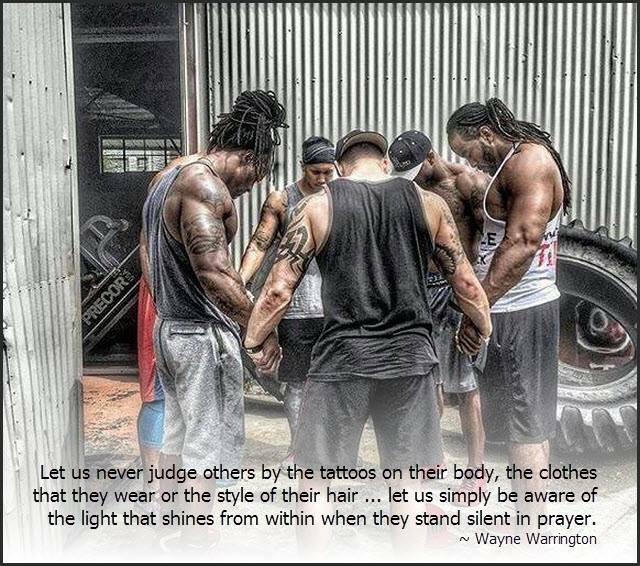 Let us never judge others by the tattoos on their body, the clothes that they wear or the style of their hair … let us simply be aware of the light that shines from within when they stand silent in prayer. I wrote this many years ago. It has been seen by thousands and shared hundreds of times through social media. It is so important that we stand by this and learn this as we journey through life. I for one learned this as one of my lessons in life. We each have our own reality, our own set of rules that we established as we grew up and as we become adults. Somehow the next part of that rule setting process was the application of our rules upon others. How sad is that. For when we think about it, would we want to have a set of rules placed upon us that were created by another who is as broken and flawed as we.